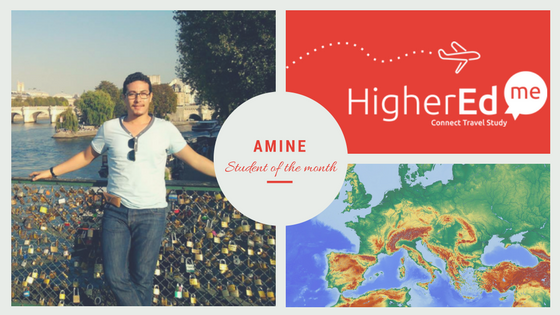 Amine is currently working in a multinational company and wishes to go back to his studies. Wanting to study Computer Science in Europe, he registered on our platform in order to get study abroad offers. As he sounded very motivated, I decided to interview him and he was pleased to answer my questions. [HigherEdMe] You want to study Computer Science in Europe. Why do you think Europe is the best place for you to do so? I chose Europe because it is known for its excellent Schools in Computer Science and their advanced technologies. Also they are in relation with big companies where I think I can improve my skills during my studies thanks to internships. On the other hand, as a Moroccan, I’m open to European culture and I would like to study in this environment full of knowledge and experiences that will complete my education. Moreover, as part of my job, I’m often in France, Spain, Belgium and Holland and it helped me get an overall idea on life there. Socializing with students, interns and professionals has made me want to pursue my studies in Europe. [HigherEdMe] You seem to know what you are talking about! Computer Science opens a lot of doors. What job would you like to do with your future degree? I have a penchant for everything that has to do with information system and what I liked the most was the management of computing project, managed operations and computer system integration. What I would love would be to combine technique and management just like the previous subject areas I mentioned. [HigherEdMe] You sound pretty motivated. But what would you study if you couldn’t study Computer Science? Then I would study Management because I have a special outlook for my future career : later on, my goal is to work in this field. I consider it as an art but also as a science and it can’t be practiced without any knowledge or studies beforehand even if, in my mind, I should keep up with responsibilities. [HigherEdMe] What would your dream School be like? The School of my dreams is a place where the practice would verify the theory. By this, I mean we could practice what we learn instead of directly moving onto the next thing. Each step or module should be applied to a practical case, once it’s done we could be able to learn other things. Every learning should be acquired this way. My dream School should also have a program based on experiences and knowledge of the past but would also follow new trends and, above all, enable to grasp the future of teaching. [HigherEdMe] It seems like a nice program. Now I’d like to learn more about you. What do you like to do when you have spare time? I’m ambitious, pragmatic, I love simplicity (it is the source of happiness). My relatives say I’m a perfectionist and an idealist but also very funny. I like having people around and getting to know new people. (The knowledge of faces is treasure : Arab proverb. I love reading books, travelling and I’m also really interested in associative work. [HigherEdMe] Thank you very much for this really interesting interview. Do you have something to add? Thanks a lot to Universities for their efforts and thanks to you for your work. Thanks to you for answering my questions and good luck with your study abroad project! Just like Amine, you want to study abroad too? Then register on our platform like he did! If you’re already registered and want to be interviewed, contact me on Facebook.